It sounds like a very dull job title and even when you know what it is, Clipboard Manager is not a term that will thrill. Yet when you both know what these tools can do and then you also actually use one, you briefly become an evangelist. Shortly afterwards, though, you entirely forget that it's something unusual and that not everyone has one. To a small extent, everyone does have one. Every single Mac since the first one has come with the ability to copy and paste items into a clipboard. We don't have to think about it and we don't even have to know the word clipboard: we just know that what we copy here, we can paste somewhere else. However, we do tend to forget that what we've copied, stays copied. It stays in this clipboard. With a single exception, you can copy something once and then paste it as many times as you wish. That exception is when you're copying a login from an app such as 1Password that will automatically wipe the clipboard after a specified time such as 90 seconds. It's specifically so that no one can come up to your Mac later and paste the password. Again, though, that just happens and we don't have to think about it so we don't. Until we paste the wrong thing. Except when we do this, we don't have to go anywhere and we don't have to copy anything again. Instead, we just tell our Mac to paste the second-to-last thing we copied. Equally, we could say the third-to-last, we could say the tenth thing we copied, and most usefully we can choose from a list of it all. That's what a clipboard manager does for us. If you're now thinking that this is nice but hardly earth-shaking, then first we'd agree with you but second we'd be pretty sure that you've never tried one. There will always be times when you struggle to find that quote you copied off the web but it's true that you will get it. There will be times when it's a pain going back to Word to do a finicky square selection in the middle of a paragraph but you will get it. Most of the time, going back to copy something again is a matter of seconds —and yet still we know you should use a clipboard manager. Never mind the times when it's hard to find what you last copied, even when it's a quick job it is still faster to use a clipboard manager than to hunt around. It also feels faster, which is hugely significant. You get right back to what you were doing, you go right back to what you were concentrating on, faster by using one of these. So there's no question, you should have one. There's some question why it isn't part of macOS and iOS. It took Apple two years to even include copy and paste in iOS. To the derision of Android users, this was a marquee feature of iOS 3 and that was released in 2009. It was a good implementation and nothing has needed to change so nothing has —and nothing has been added. In 9 years. Except in 2017 when Apple did make a tweak to the clipboard on both iOS and Macs. It linked them. In theory, if you copy something on your Mac, you can now immediately paste it on your iOS device or vice versa. In practice, yes, that's what happens —nearly all of the time. This is a very good feature, we use it a lot, and it is making the clipboard a bit more active than it was. It's just not doing anything more and after all this time, Apple doesn't appear likely to add anything like a clipboard manager. Which means that the market is wide open to third-party software developers and a plethora of them have stepped up. Every one of them does the same job but they do it differently and often they include the clipboard manager as just one small part of all they provide. This means that picking what's best for you is easy because any of them will do. It's also difficult because so many apps include this functionality that you may well have several already. The choice then is not about what to buy but which to remember to use. That's the case on the Mac. The iPhone and iPad are more complicated. Let's just handle macOS first. 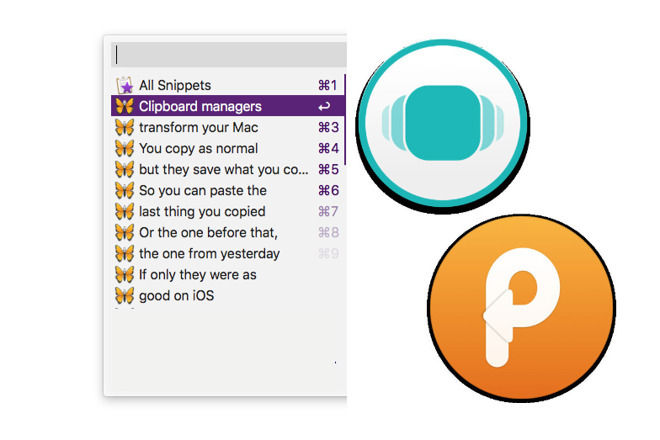 We recommend two apps that are solely clipboard managers, that don't try to do anything else. They are the very visual Paste 2 and the more text-based Copied. 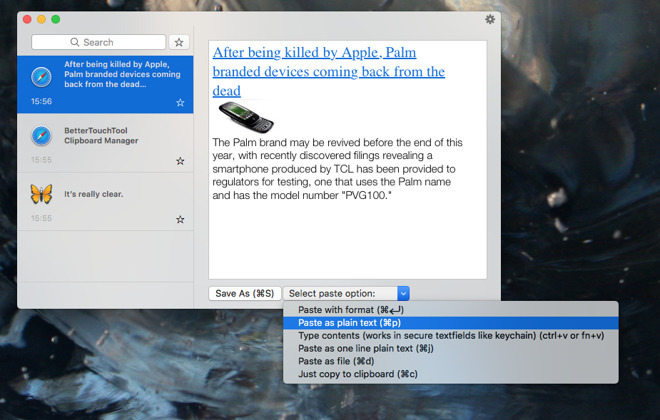 Paste 2 is superb at showing you what you've recently copied. Call it up with a keystroke and along the bottom of your Mac's screen there will be a wide filmstrip-like display of the last many items you copied. It's really clear. If you copied an image, you see the image. If you copied a web page, you see the web page. Spotting which thing you want to paste could not be simpler —so long as it's recent. When you have to scroll through many items to find what you need then Paste 2 is slow. Copied, on the other hand, is far less visual but that means it displays many more things in its list of copied items before you have to scroll or search. Copied costs $7.99 on the Mac App Store. Paste 2 is $14.99 on there. Both come with free iOS companion apps. Financially, you're better off buying an app that includes clipboard management as part of its range of features. For something that you'll use as often as you will a clipboard manager, though, we'd tell you to just spend the cash —except for one thing. 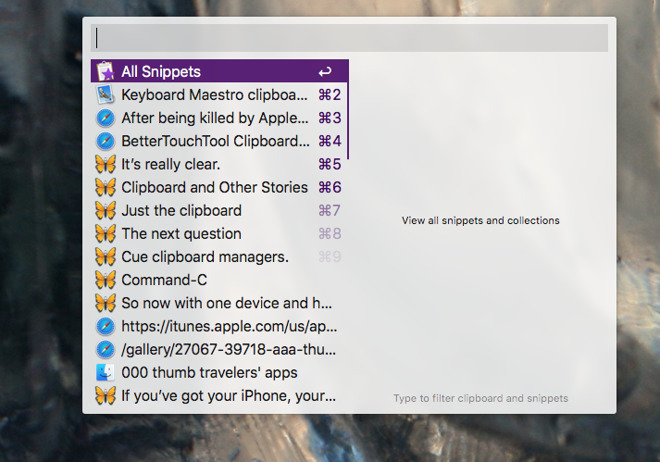 When the clipboard manager is just one part of a bigger app, that bigger app tends to be very powerful. So much so that you are unlikely to exploit all it does or maybe even see how much it can do. By getting one of these and trying out its own clipboard manager, you're making better use of these powerful apps. Such as Keyboard Maestro. Using this to just let you paste the item you copied before last is like hiring a stretch limo to take you to your kitchen but it will get you there in style. In ordinary use, if you wanted to paste that thing from earlier then you call up Keyboard Maestro's clipboard manager and choose it. Without you doing anything else, though, it leaves that manager window open. That's good for when you're filling out a form online and can see where you copied your name, your address or so on. It's less useful when you just want to paste something and get on with your work. Keyboard Maestro can do that but you have to tell it that you want this to happen. Just as you have to tell it what keystroke you want to use to call up its clipboard manager. Just as you can also use the clipboard in the app's more complex automation tools. For a simpler but in its own way powerful alternative, we use Alfred 3. It's a Spotlight replacement that does many things but as useful as we've found it, we tended to forget we had Alfred 3 installed. Until, that is, we found its clipboard manager features. Now it's rare for us to go a day without using it. That's chiefly because of the sheer speed and convenience. Tap the right keys and Alfred shows us a list of everything we've copied. More, the top ten most recent ones will have a keystroke next to them. So you know right away that pressing Command-3 will paste in the third item on the list. Then there's also a search bar in the manager: start typing in something and Alfred will display everything you've copied that matches. Then scroll to one, press the Command keystroke or simply hit Return. That pastes the item in and Alfred's list goes away. Alfred 3 is free but to get the clipboard manager you need the Powerpack add-on which costs $25 direct from the developer. Alfred 3 is all about using your keyboard to find or launch things. Keyboard Maestro has keyboard in the title. When copy and paste means Command-C and Command-V to you then it feels right that this feature should be in an app concerned with keyboards. What's a bigger surprise is to find it in BetterTouchTool too. This is a utility that lets you control your Mac by tapping or pinching on your trackpad and it comes with this tool just for pasting whatever you've recently copied. Once again, you have to tell the app when you want to call up its clipboard manager. You set a gesture on your mouse or trackpad and then when you do that, up it pops. It's very similar to how Keyboard Maestro has done it, except that it vanishes as soon as you've pasted something. BetterTouchTool costs from $6.50 direct from the developer and is also available as part of the Setapp subscription service. You shouldn't buy it or any of these solely for their clipboard management features. Yet if you want to add gestures to your trackpad, you're going to get BetterTouchTool. 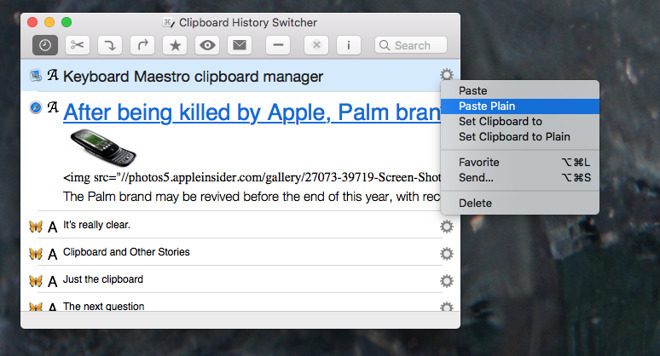 If you want to automate your Mac in any way, Keyboard Maestro will be on your shopping list. Or if you want more search features than Spotlight, you're buying Alfred 3. Get any of these and if you also exploit the clipboard manager they include, we vow that you'll be happy. Until you turn to your iPhone. 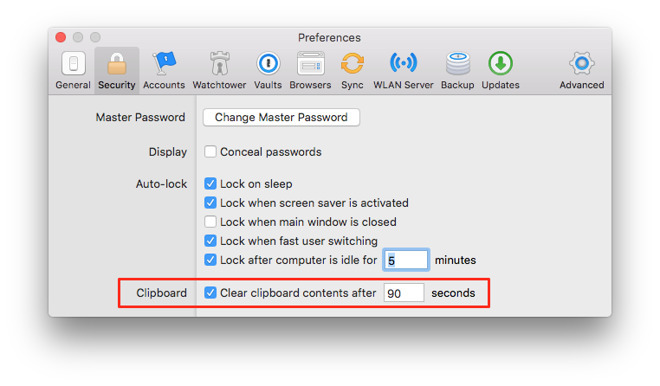 You can make a case for Apple deciding to never offer clipboard management features in macOS because it's another layer of complexity. They would be telling new Mac users that yes, you can just copy and paste but you can also do all these other things. We don't agree that it's complicated but we could see the argument that it adds to what new users have to learn. So it's not a surprise that Apple hasn't done it on iOS either but there the company has actively prevented anyone else from doing it. You can copy and paste on iPhones and iPads but it is specifically iOS that is controlling all of that from start to finish. As Apple keeps all apps separated from each other, you're copying from one app into iOS and then pasting from iOS into another app. Nothing can get in between that to save everything you copy. No clipboard manager can work in the background to help you out later. 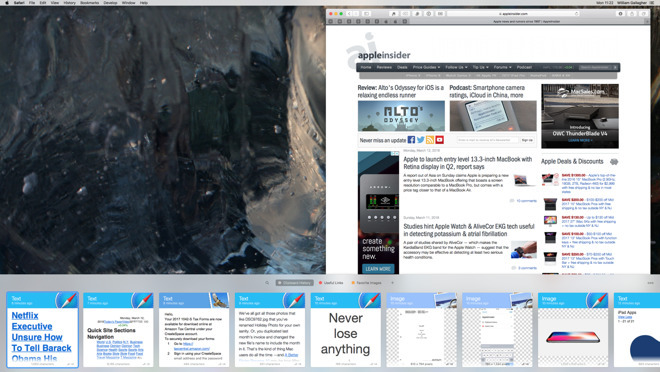 Still, there are iPhone and iPad clipboard managers. For instance, there are iOS versions of both Paste 2 and Copied. However, no clipboard manager is ever going to be as useful on iOS as it is on a Mac. Not even close. Yet that doesn't stop developers trying to work around the problems. They do it by finding quick ways that you can elect to copy things and paste them directly into the clipboard manager. You then go on and paste them wherever else you want, but you've stopped by the manager and saved them in there. You can do this. You can copy something from Twitter, launch a clipboard manager app, paste it in there and then go on to also paste it into an email. You won't, though, because it's a chore and if you ever forget to do it, you're no better off than if you didn't have a clipboard manager. However, there are ways to slightly speed this up. 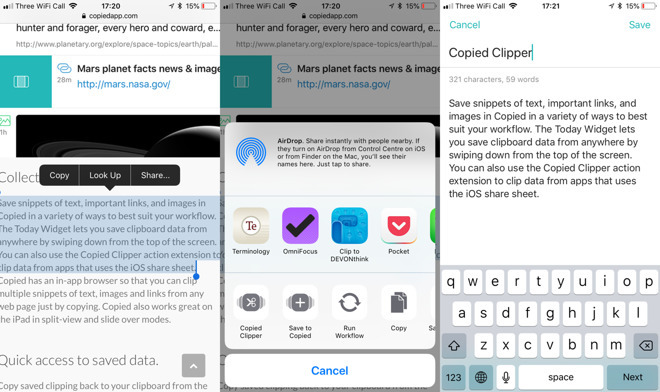 Copied for iOS installs a Share Extension into iOS. As long as the app you're using has a Share button, you can select something, tap on it and choose Share. Choose Save to Copied from the screen that pops up, and you're done. 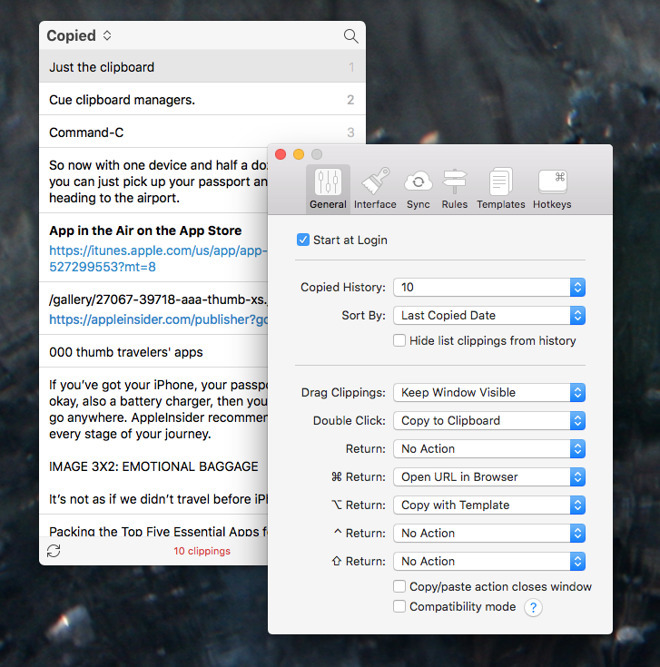 Alternatively, you can choose to tap on Copied Clipper. This, too, saves it to Copied but first opens it up in a dialog box. It shows you exactly what you've copied plus it lets you give that clipping a title. Copied Clipper lets you then send the item on to someone else or perform some actions on it such as transforming everything from uppercase to mixed title case. If something doesn't have an option to share then you can copy it in the regular way and then call up iOS's Today widgets. There's a Copied widget and if you have that in your Today view, then it immediately grabs your clipboard and saves it. That's definitely faster and handier than having to go find the Copied app but it's still not as useful as on the Mac. Or rather, it's a little useful in a very different way. We use a clipboard manager on iOS when we're building up to something , when we're collating details that we'll use later. So it's not that we use one every day but we're glad it's there when we need it. 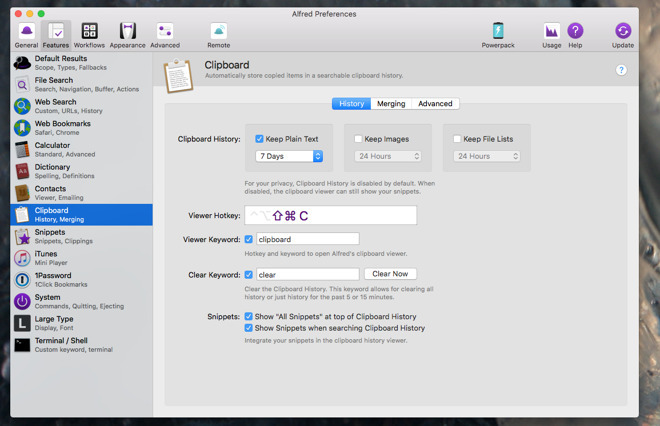 Whereas we use a clipboard manager on our Mac constantly. We'd like to see this be handled by Apple, we'd like to see it as a core feature of macOS. Yet even while it isn't, there are these superb alternative apps that give our Macs this tremendous feature.